The Golf Blog says: As he turns 40 years old, Tiger Woods has fallen behind the pace of winning majors set by Jack Nicklaus, who had 15 majors before he turned 40 years old. Jack then won 3 more majors up until he hit 46 years old. This is a key turning point. For most of his career, Tiger Woods was ahead of Jack. You’d have to go back to Tiger’s early twenties for the last time that Jack was ahead in terms of majors won by age. Now, Tiger has fallen 1 major behind Jack’s pace to 18 majors. As shown above by the red flatline, the biggest concern for Tiger is that he’s in the longest major drought of his career–7 years and running. Given his back surgeries and swing changes, plus Tiger’s own concession that “everything beyond this will be gravy,” the prospect of Tiger catching Jack’s 18 major record seem fleeting. 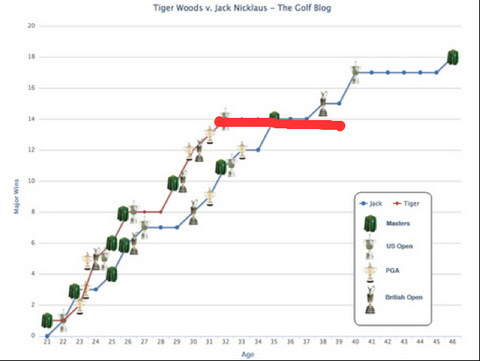 And the chance of Tiger beating Jack’s record seems nil.